SCIMEDX CORPORATION is a highly flexible diagnostic company, with over 35 years experience in the area of In Vitro Diagnostics. The strength of the organization is the collective diversified experiences of the personnel in many areas of diagnostics and biochemistry. We specialize in immunofluorescence, ELISA and membrane technologies for a variety of unique and routine autoimmune and infectious diseases. 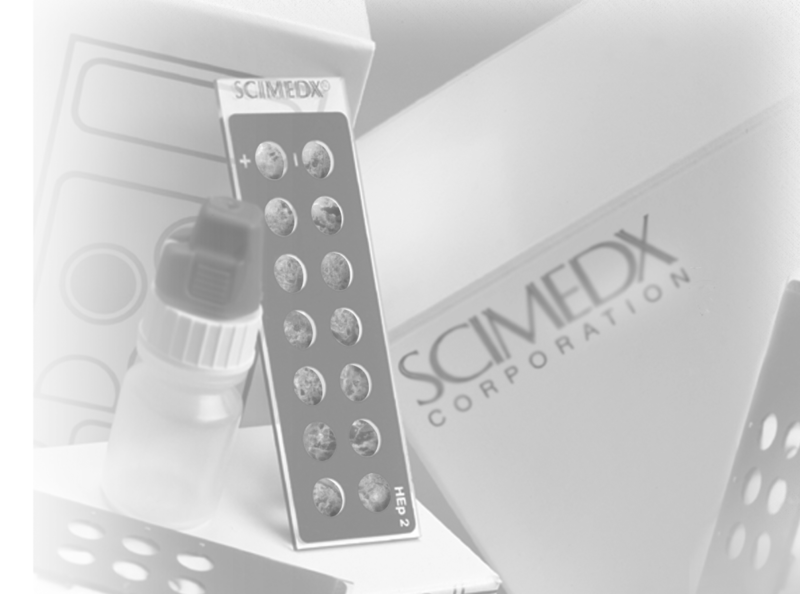 Scimedx combines product development, manufacturing and distribution with a keen awareness of laboratories needs. Intended for the qualitative and semi-quantitative detection of antibodies to chlamydiae in human serum or plasma. Detection of chlamydial antibodies in humans can be used as an aid in the diagnosis of current infection and can provide serological evidence of previous chlamydial infection. Intended for the serologic detection of anti- bodies to Coxiella burnetii. Each well contains fixed Phase I and Phase II. Virulent isolates are of the phase I type, while serial passage in eggs or tissue culture is required for selection of the avirulent phase II transition. These phases are serologically distinguishable and quite useful in the serodiagnosis of both acute and chronic C. burnetii infections. Intended for the serologic detection of antibodies to Ehrlichia chaffeensis, the causative agent of human monocytic ehrlichiosis (HME), in human serum. The human granulocytic ehrlichiosis (HGE) agent has recently been designated Anaplasma phagocytophilum. Clinical presentation is similar to that of HME, but when ehrlichial morulae are detected they are in circulating granulocytes rather than in monocytes. Quantitative Immunofluorescence assay intended as a confirmatory procedure only in conjunction with a positive STS screening result for the diagnosis of syphilis. The FTA-ABS test should not be used as a screening test since it does not distinguish a current active syphilitic infection from a previously cured syphilitic infection. Intended for use in an indirect immunofluorescent assay (IFA) or Direct immunofluroescence assay (DFA) for the detection of Legionella pneumophila serogroups 1 through 6 and/or Legionella bozemanii, dumoffii, gormanii, longbeachae, micdadei, and jordanis in human serum, cultures and clinical specimens. Indirect Fluorescence Assay for Orientia tsutsugamushi IgG Antibody is intended for the qualitative and semi-quantitative detection of IgG antibody to O. tsutsugamushi in human serum or plasma. Detection of O. tsutsugamushi IgG antibody in humans can be used as an aid in the diagnosis of current infection and can provide serological evidence of previous Orientia tsutsugamushi infection. Indirect Fluorescence Assay for Rickettsia conorii IgG Antibody is intended for the qualitative and semi-quantitative detection of IgG antibody to R. conorii in human serum or plasma. This test can be used as an aid in the diagnosis of current infection and can provide serological evidence of previous Rickettsia conorii infection. Indirect Fluorescence Assay for Rickettsia prowazekii IgG Antibody is intended for the qualitative and semi- quantitative detection of IgG antibody to R. prowazekii in human serum or plasma. This test can be used as an aid in the diagnosis of current infection and can provide serological evidence of previous Rickettsia prowazekii infection. Indirect Fluorescence Assay for Rickettsia rickettsii IgG Antibody is intended for the qualitative and semi- quantitative detection of IgG antibody to R. rickettsii in human serum or plasma. This test can be used as an aid in the diagnosis of current infection and can provide serological evidence of previous Rickettsia rickettsii infection. Indirect Fluorescence Assay for Rickettsia typhi IgG Antibody is intended for the qualitative and semi-quantitative detection of IgG antibody to R. typhi in human serum or plasma. This test can be used as an aid in the diagnosis of current infection and can provide serological evidence of previous Rickettsia typhi infection.